Note: Athletes have one opportunity at each station to accumulate as many repetitions as possible. In addition, athletes can pick their start station, but must honor the order of rotation. 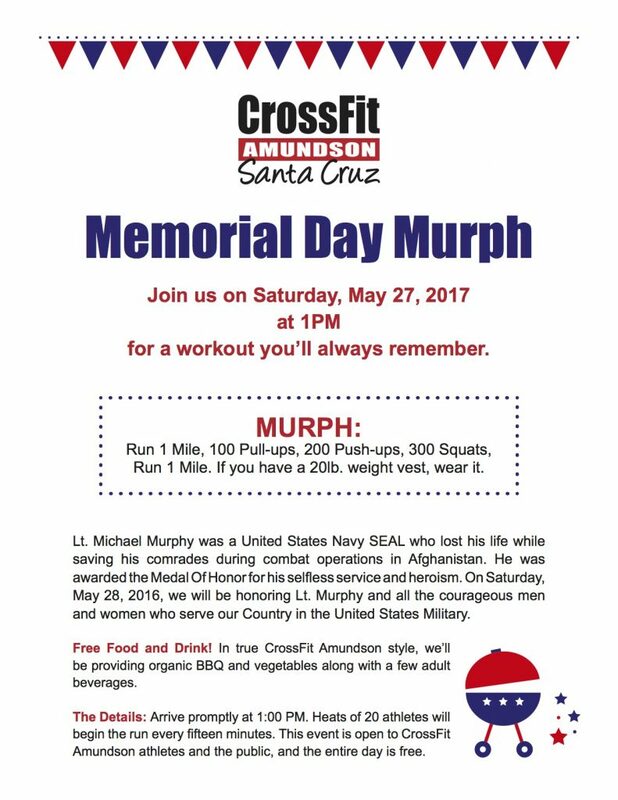 Memorial Day Murph is this Saturday as 12PM! The 2017 Memorial Day Murph is this coming Saturday, May 27, 2017. The event starts at 11AM for warm-up, coffee, and jump-house kickoff for the kids. The WORKOUT BRIEF takes place at 11:30 AM, and the FIRST HEAT launches at 12PM. Rx + Division: Murph, with Repetitions Completed in Order (100 Pull-ups, 200 Push-ups, 300 Squats). This year we also have a SUPER CHALLENGE, which will be an ADDITIONAL 10 x rounds of “Cindy” following Murph. Please sign up at HQ this week for your Division. Any questions, check with Brett, Britain or Greg.